Now that you’ve learned how to view and use dashboards, this tutorial will show you how to view and use saved Looks. You can view and click on Looks as much as you want without impacting other users! The only way to affect anyone else is if you click the Edit button and make changes (see this documentation page to learn more about saving and editing Looks). Once you’ve mastered viewing Looks, learn more about exploring and creating visualizations. You can choose to view the Look simply, if you just need to see its underlying data. You can choose to explore the Look, if you want to use it as a starting point for further data exploration. This tutorial focuses on simply viewing the data. Look at our Exploring Data page if you’d like to learn about exploring. For Looks with the Run on Load option disabled, the data will not load automatically. Click the Run button in the upper right to load the data. You can learn more on this page. The title of the Look. Information about how long the report took to run and how old the data is. How long ago the data was queried (to display the date and time, hover over the relative time information). The time zone of the data you’re viewing, if your admin has enabled user-specific time zones. Details about the report. This might include a description if one has been added, a list of scheduled deliveries the Look is a part of, and which dashboards the Look is a part of. A list of filters that have been applied to the report, if any. If the Look was created with adjustable filters, you can temporarily change them to limit the report to the information that you’re interested in. Just remember to hit the Run button in the upper right after making any changes. Unless you click Edit and make the change in edit mode, changes to the filters are temporary and do not affect other users. The chart associated with the Look’s data. Additional details about each data point, which are revealed by hovering over that point on the chart. Sort order. Click on a column heading (or several using the shift key) to sort the values in the column. 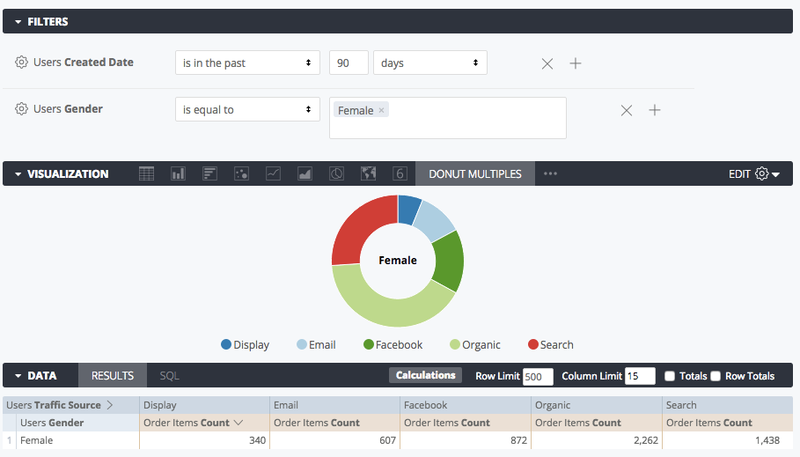 Discover will adjust the results and automatically rerun the query if necessary. Row and column limits. After making changes to the limits, be sure to hit the Run button in the upper right to run the query with the new limits. Unless you click Edit and make the change in edit mode, changes to the sorting or limits are temporary and do not affect anyone else. If the field has a description defined in its LookML, hovering over the table column header will display the description. Depending on your permissions, next to each dimension or measure label you may see a purple icon that provides a Go to LookML link directing Discover developers to view the data modeling language. If you make any changes while viewing a Look, such as changing filters, sorting a column, or changing row limits, you can return to the Look’s original settings by clicking Reset Look. As you gain familiarity with Discover you’ll begin to use saved Looks as a launchpad for further exploration. You can start with one set of data and then begin exploring the answers to related questions by changing the filters, changing the visualization, sorting the data differently, or making other changes. You can learn about these exciting possibilities in our exploring data tutorial. If your Discover admin has enabled user-specific time zones, Discover will provide a menu for choosing your time zone. The time zone setting affects the data returned when filtering for “today”, “yesterday”, and so forth. You can learn more in this documentation page. If your Discover developers have enabled it, you may be able to drill into a value on your report. For datasets where the row limit is reached in the Details window, Discover provides a link for downloading the complete set of results. Click the link to download the data, using the same options as shown on this page. Discover also makes it possible to get more specific information about a data point by drilling into a Look’s visualization. To do so, simply click on the part of the visualization about which you’d like more information. If your Discover developer has included any custom visualization types, it may not be possible to drill into those visualizations. You can choose which type of drill to perform when you click on the item of interest. In the example below, we’re clicking on the Search slice of the Female donut chart on the left. Doing so gives you two different options. 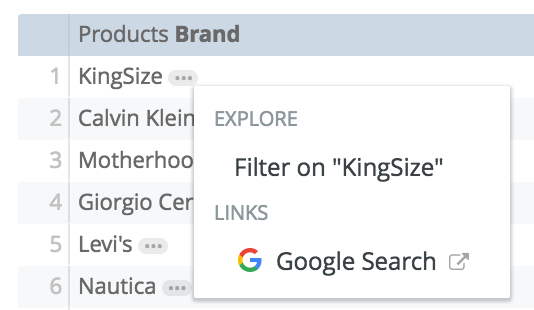 You can choose to see row level data for all 1,438 female customers who found us via search, or you can choose to filter the visualization to females only. The options that appear to you will change depending upon the data and visualization you’re using. When exploring a Look, you can navigate to other items within the same Space by using the drop-down in the upper left. You now know how to view and understand existing Looks. 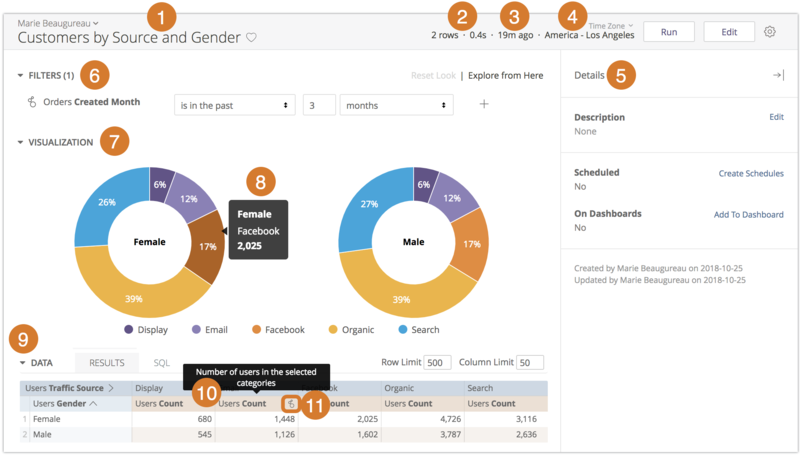 If you’d like to learn how to create your own reports, check out our Exploring Data page. Otherwise, in the next section you can learn how to share information that you find in Discover.